I remember the first time I saw Star Wars Episode Four and Fell in love with this powerful, beautiful women who could not only shoot a gun but was a princess to boot. So reading this was an in-depth look into not only my favorite princess but the amazing women who played her. I really loved the beginning of this book. Fisher was witty, comedic, but most of all she was completely honest. If there is one thing I appreciate when I really a nonfiction memoir, it is honesty. 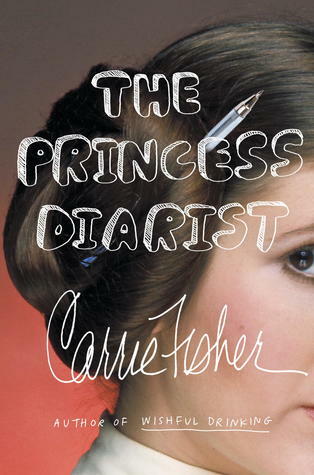 However, once she got to the Star Wars portion in her life, however, I felt like the book felt a little flat for me. Maybe it was the tangents she seemed so constantly interested in going down. Maybe because I had a weird veil lifted from my eyes, or maybe I just couldn't get as into it as I wanted to. I did like her poetry and her diary entries as it seemed like I was sharing something intimate with Fisher. Something I am sure if she had known would have made fun of me for. While I did like her book her strongest parts were the opening and ending of the book for me. While a little disappointed that I did not love this book, but I did like it enough to rate it 3.5 stars. If you loved any of Fisher's past work then you would like this book as well.